6:30 – Wakey Wakey – it’s time to wake up and get ourselves ready for the day ahead. 7:00 – Breakfast prep – We ask our guests to order their breakfast the night before for several reasons but that doesn’t mean we have less work to do. Our Cumberland sausages (from our local butchers Thomasons) take at least half an hour in the oven and as the fruit salad is one of the more popular items on the menu then much fruit chopping is required! 8:00-10:00 – Breakfast – Our breakfast service runs from 8am until 9am. I am what they call “front of house” whilst Richard stays in the kitchen as “cook”. So, I take the orders for tea/coffee/juice and toast and oversee the preparation and serving of the starters (fruit salad/porridge etc.). All the while Richard is making sure that the guests’ cooked breakfast will be ready for when it is wanted. 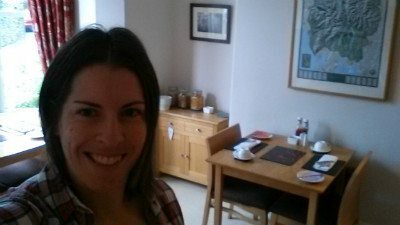 I have no idea how many times I go between the dining room and the kitchen on a normal day but if we’ve got a house/breakfast room full then it’s probably pushing 70 trips! 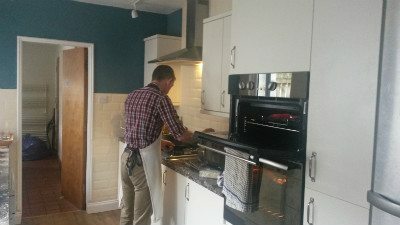 Richard in the kitchen – it’s all go! 9:30-10:00 – I clear all the tables of the used plates/tea/coffee pots/butter dishes and take them all through to the kitchen. And you’re probably thinking “all you have to do is load the dishwasher and job done”. But, not everything can go in the dishwasher. Poor Richard stands over the sink washing pots and pans for around 20-30 minutes after breakfast is finished. 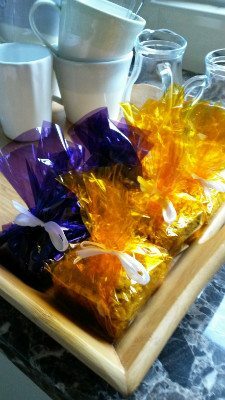 10:30-11:30 – Room Service – Guests normally leave the house for their daily dose of Keswick between 10am and 11am. This is our chance to get into their rooms and give them a quick service. Bins need emptying, dirty mugs and glasses need changing, beds need to be made and essentials such as toilet rolls and tea bags need to be replenished. Some rooms are easier to service than others so the whole process can take anything from 15 minutes to 45 minutes. If we have a “check-out” then obviously the room needs to be completely changed over. 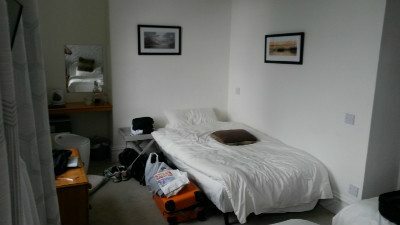 My jobs are normally to strip the beds (and get the washing on) and make them up again, dust all surfaces and make the room generally tidy and ready for the next guests arriving. Richard gets the fun job of being in charge of cleaning the bathrooms! Once the rooms are serviced/cleaned, then the dishwasher can be turned on. 12:30 – Lunch – We hope to have everything done by midday so we can sit down together and enjoy a home cooked lunch. 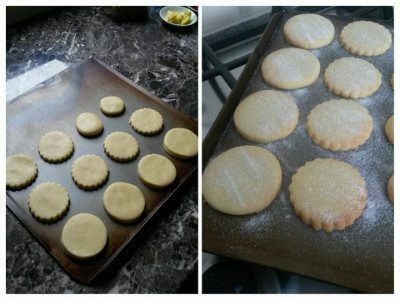 Homemade shortbread biscuits – delicious! 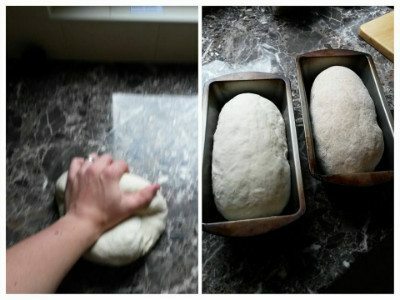 The dough now needs shaping and placing in tins ready to be proved again (approx. 45 minutes) before going into the oven for 30 minutes. 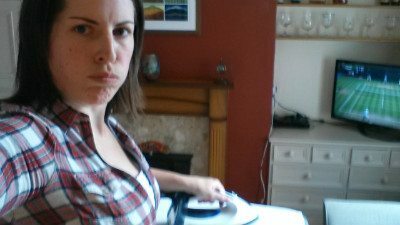 15:00 – Ironing – once all the baking is out of the way it’s onto one of the most tedious jobs, ironing! As we only have four bedrooms we do all our own laundry; washing, drying and ironing. Don’t get me wrong, we don’t have to iron every day, it all depends on our guests. 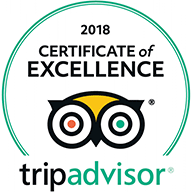 If we have a “check-out” in the morning then all the bedding and towels from that room need to be washed (this starts at around 10am if our guests check-out on time). Now, imagine if all four rooms check-out on the same day (which happens more often than you would think), that’s four rooms to clean and four lots of bedding to wash/dry and iron. It’s not fun. I will admit that I’ve become much quicker at ironing than when I first started in this job but it can still take well over an hour to get it all done, especially if there’s four lots of bedding to do! Plus, if there is a lot of ironing to do then Richard and I will share the workload. 14:00-22:00 – Guests Arriving – we’re quite flexible with our “check-in” times and allow guests to check-in any time between 2pm and 10pm. We always ask our guests to inform us what time they are hoping to arrive at Grassmoor (approximately) so we can be sure to be around to welcome them when they arrive. This often means waiting in the house for a knock on the door. Fortunately most people are reasonably accurate with their timings so we don’t have to wait around for long. As I am in charge of the meet and greet then this is the time when Richard is able to go out into town to pick up any shopping that we need – fruit, milk, sausages etc. If we have no guests arriving it gives us an opportunity to go out for a stroll together and get some fresh air, or maybe enjoy an ice cream in the park! So, that’s it. A day in the life of a guest house owner. Or should that be TWO guest house owners? Because after all, this is a team effort, and there’s no way either of us would be able to do all that work, every day, all on our own. It helps that we enjoy what we do as well… apart from maybe all the ironing!